Hello friends! The South Pacific is a land of many colors. Whether it’s the classic hibiscus or a lokelani design, Pacific Islanders love floral patterns. Not in drab gray or boring beige, but bright pinks, yellows, oranges, greens, purples, yellows — and all the other colors of the rainbow! In the Cook Islands, they take their love of colors to a new level where the cultural tradition of tivaeve is a respected practice. Tivaevae involves sewing colorful and ornate quilts by hand. As you can imagine, each quilt takes many hours to make. But these quilts are not just for sleeping under. No, they are treasured as works of art! They are often given as special gifts when someone gets married or has an important birthday. Tivaevae quilts are precious heirlooms, passed from generation to generation. Tivaevae is hard work. That’s why it’s important to have friends to encourage you and help you out. 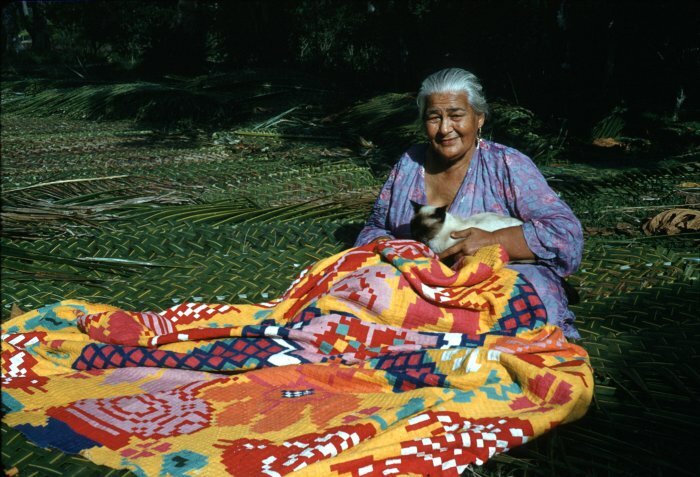 But quilting isn’t a job for the Cook Island women who dedicate their free time to it. It’s also a chance to spend time with friends and share stories. Everyone works together, cooperating to make sure every quilt is more pretty and perfect than the last! Friends working together and having fun? Sounds like the perfect Rainbow Pals activity to me! Learn more about tivaevae on the Australia Network. Thanks to the National Library of New Zealand for the great photograph!